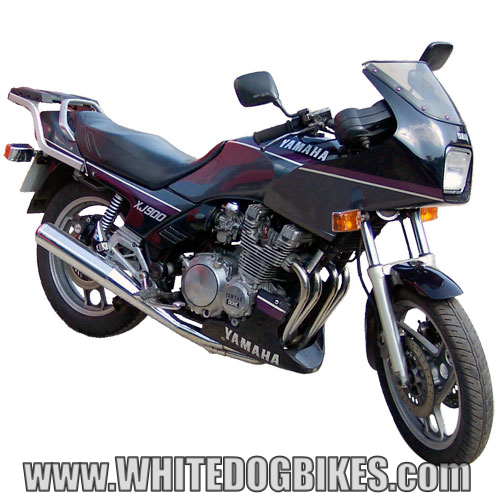 A little bit about the Yamaha XJ 900 (pre diversion)…..
XJ900F (Feb 1985 to Dec 1986)….. Description: Sports tourer with an 891cc air cooled 4 cylinder engine and a 5 speed gearbox. It had twin front and single rear disc brakes, twin rear shocks, 18 inch cast wheels, 4 into 2 chrome exhaust, half fairing with square headlamp, belly pan and alloy pillion grab rail. XJ900F (Jan 1987 to Dec 1990)….. 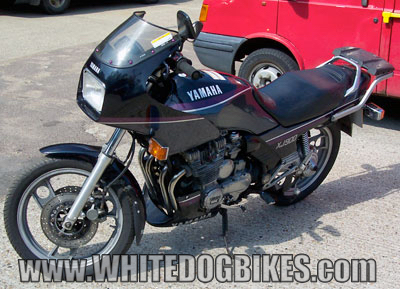 Description: Same as above model but with slotted front disc brakes (instead of ventilated) and ‘Yamaha’ logo on the petrol tank. 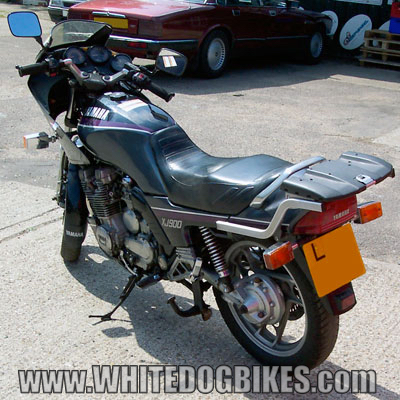 XJ900F (Jan 1991 to Dec 1991)….. Description: Same as above models with a few minor changes. 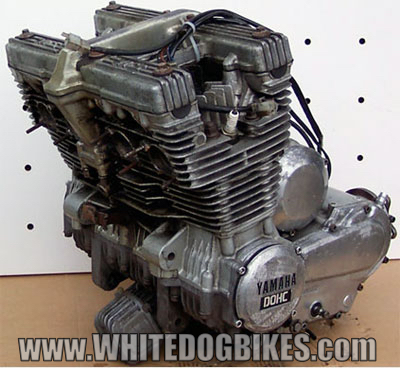 XJ900F (Jan 1992 to Dec 1994)….. Description: Same as above models. Clutch: Wet multi plate clutch – EBC part no: CK2255 for the clutch and CSK017 for the springs (don’t forget a clutch tool to hold it! The YB14L-A2 battery is a lead acid 12 volt, 14 amp/hour battery and is length: 134mm width: 89mm height: 166mm in size (more info…). 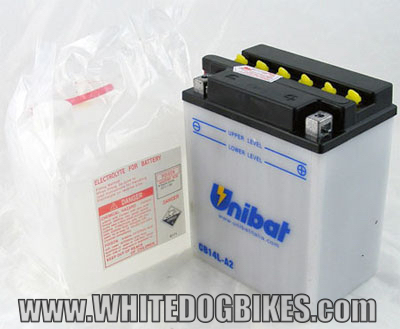 The 1st letter(s) of the battery reference code are a manufacturers reference mark and may vary between different battery makes (different battery manufacturers use different 1st letters), so CB14L-A2, YB14L-A2 and EB14L-A2 are all the same battery just from different manufacturers (more info…). Also…… I would personally recommend avoiding buying the cheapest of the cheap type batteries online as they have a horrendous failure rate (and they can be a bug!er to post back when it fails as Royal Mail and alot of couriers won’t accept batteries now). Shocks, brakes and wheels stuff….. Launched in the UK in 1985, the XJ900 F was an improved version of the previous XJ900 (31A model). The 1985 model had a decent frame mounted fairing, instead of the handlebar mounted fairing, an 891cc engine instead of the 853cc engine found in the previous model and 1mm bigger carbs (36mm instead of 35mm). 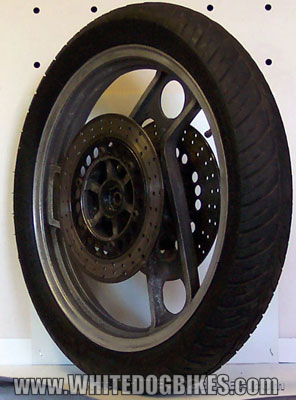 The XJ900F remained mostly unchanged during it’s 9 year production lifespan, although post 1987 models had better front brake discs and a few minor mods. Firstly, if your thinking of buying one always HPI check it! The XJ900F was a fairly good and solid bike and has a fairly loyal following. But, as the youngest of these beasties will be 24 years old now they can have a few problems. One of the biggest problems the XJ900’s suffered from was rot on the fuel tanks, the tanks had areas where water used to gather which led to the tank rotting (these are almost impossible to source now, and if you do find a good one, it’s unlikely to be cheap!). Also, the CDI’s are known to fail and again, good 2nd hand ones can be hard to come by. Apart from the 2 bits above, there’s not many other problems, but due to age and the often higher mileage on these bikes (as they were good for touring), forks and exhausts may need work. 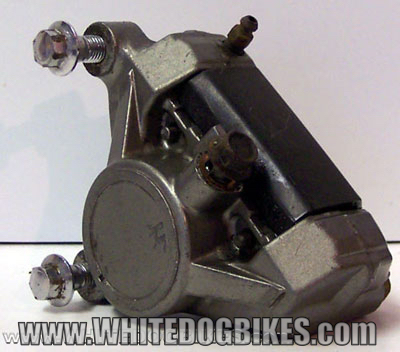 Very informative write ups from WhiteDogBikes. 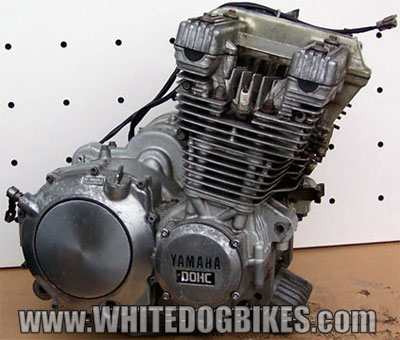 Ive just found a xj900 pre diversion but it has a nasty rattle below 2000 rpm. Could be timing chain, or do they have known rattle problems. Have I made sense. 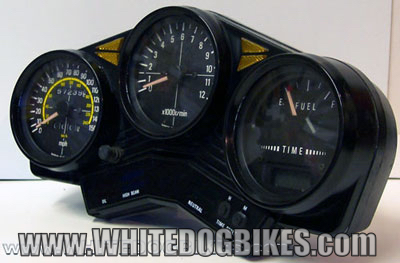 How many miles has the bike got on it and does it still make the noise with the clutch lever pulled in? Could be cam chain or cam chain tensioner (or both) in need of replacing. I need a new 4-2 exhaust, and my bike is converted for sidecar use with small wheels, Earles front-fork and frame-reinforcements, so I can’t use the 4-in-1 I bought. Up to which year can I use the original 58L exhaust, as these are very hard to come by, but later is much easier. 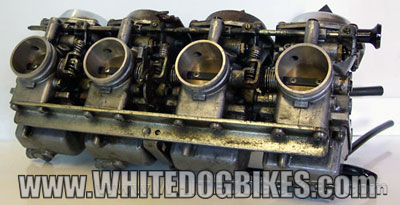 The Diversion won’t fit – engine is different, but can I use the EBB1 and EBB2 exhaust? I think the exhaust is the same for the 1985 to 1990 models (can’t say for certain though!). 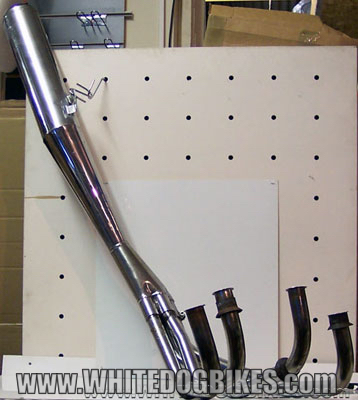 Alternatively, could you get your exhaust modified to fit by a smaller metal working/fabrication shop? 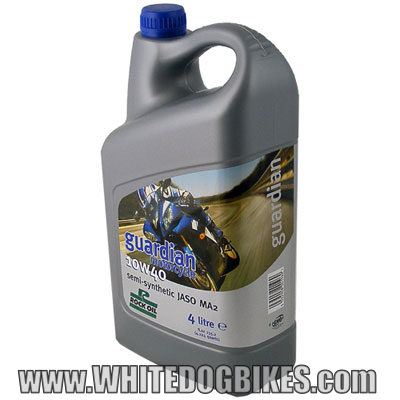 I have made some investigation, and been incontact with Yamaha Nwetherlands (European importer) large Yamaha shops in the UK, Netherlands, France and Germany. Situation is that it is possible to find the original combo-box, aftermarket mufflers, seals, rings e.t.c. 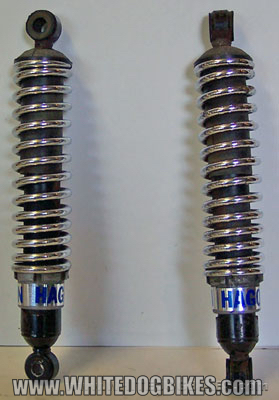 The down-pipes are impossible to get as new, and very hard to find in usable condition as used. Marvin in Italy has a 4-1 system which fits any pre-Diversion model. I had the extreme luck to find four down-pipes in surprisingly good condition in Germany, the chrome has very little surface rust. I’ll use these for the summer, and when season ends late October they will be re-chromed together with the ones I scrapped. The replacement situation changed their status from “rusty” to “rechromeable”. Yamaha quality is good, after all they lasted 28 years. I still haven’t figured out how they make a double-walled pipe, bent in all directions.